A lieutenant colonel in the U.S. Marine Corps Reserve explores the development of the U.S. Marine Corps, focusing on the period from World War II to Vietnam. 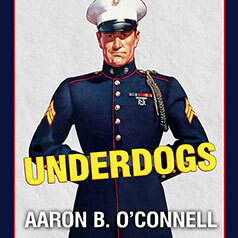 Aaron O'Connell focuses on the period from World War II to Vietnam, when the Marine Corps transformed itself from America's least respected to its most elite armed force. He describes how the distinctive Marine culture played a role in this ascendancy. Venerating sacrifice and suffering, privileging the collective over the individual, Corps culture was saturated with romantic and religious overtones that had enormous marketing potential in a postwar America energized by new global responsibilities. Capitalizing on this, the Marines curried the favor of the nation's best reporters, befriended publishers, courted Hollywood and Congress, and built a public relations infrastructure that would eventually brand it as the most prestigious military service in America. But the Corps' triumphs did not come without costs, and O'Connell writes of those, too, including a culture of violence that sometimes spread beyond the battlefield. And as he considers how the Corps' interventions in American politics have ushered in a more militarized approach to national security, O'Connell questions its sustainability.